Imbriano began his entrepreneurial career founding TrinityOne in 2006, a sports marketing agency that fuels brands, athletes and teams in brand and revenue growth (Trinity1.com). Imbriano has worked with teams such as the New England Patriots, Boston Celtics, Richard Childress Racing, Millwall, FC, the New Hampshire Fisher Cats, the New England Revolution, Washington Capitals, Wizards and Mystics and organizations including, Fidelity Investments, Massachusetts Educational Financing Authority, Survey.com, Best Buddies, New England Baptist Hospital, Shields MRI, Morgan Stanley, Havas and many other global companies. 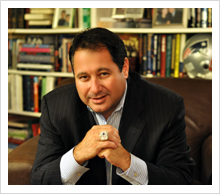 Formerly the Vice President and Chief Marketing Officer of the New England Patriots, New England Revolution and Gillette Stadium for nine seasons, with double duties as Chief Operating Officer for the New England Revolution for Three seasons, Imbriano built powerful relationships that allowed the organization to achieve an increase in revenue by more than 600%. Imbriano joined the Kraft Sports Group in 1997 to oversee the sales and marketing for the New England Patriots, New England Revolution and Foxboro Stadium. His sales and marketing leadership propelled the Kraft family’s sports and entertainment ventures among the highest revenue-generating entities in the country. Simultaneously, he vastly broadened the scope of marketing programs and business initiatives for the teams and stadium. In 2002, the Kraft family christened CMGI Field, later renamed Gillette Stadium, a $325 million-dollar privately financed state of the art sports and entertainment facility for which Imbriano negotiated two multi-year, multi-million dollar stadium naming rights deals. Imbriano also negotiated deals to name all three stadium entrance gates, the Fidelity Investments Clubhouse, and the parking lots around the stadium property, totaling more than one quarter billion dollars. In 2003, Lou expanded his role with the Revolution, overseeing all business aspects of the soccer team, while continuing to oversee Patriots and Gillette Stadium responsibilities. His immediate business re-structure made great strides in making Revolution Soccer a healthy and viable business, as he took the team from millions of dollars in losses to a position of profitability. Imbriano was the chief negotiator for team and stadium corporate sponsorships and oversaw all sales initiatives, marketing programs, advertising, promotions, event planning, premium services, broadcasting, and game entertainment. He created and developed many on-going endeavors for the organization including: Patriots Experience, New England Patriots Charitable Foundation Annual Golf Tournament, New England Patriots Charitable Foundation Annual Kickoff Gala, Super Bowl Revenue Capitalization Plan, New England Revolution’s Soccer Celebration, New England Revolution Center Circle season ticket program, New England Revolution Presidents Club and Netside Terrace hospitality programs, as well as Revolutionsoccer.net radio and Patriots.com radio programming. Lou also designed the blueprint to achieve the largest single game attendance in MLS history (2002 MLS Cup). Imbriano began his career working as a sports producer for WHDH radio in Boston, where he produced all of the station’s sports talk shows and sports specials, including the broadcasting of the New England Patriots football games. After four years at WHDH, he joined WEEI as the executive producer for Boston’s only all-sports radio station. In 1994, he was promoted to station management, and was responsible for creating, formatting and developing marketing programs, on-air programming, events and station initiatives. Imbriano has created, formatted, produced, and developed numerous successful events, broadcast programs and business entities. He created and produced Sports Jam, an interactive sports fan festival that incorporated aspects of all of the major professional sports teams in New England. Imbriano co-created and formatted The Phantom Gourmet, a food and dining television program. Lou also played an important role in creating and/or producing the WEEI Celebrity Golf Tournament, The A Team, The Hot Dog Safari, The Dee Brown Slam Dunk Tour, An Evening with Boston Super Stars, WEEI Madness, Jambalaya Crusade, Tuesday Night Football, Team 850 Racing, Ciao-Chow Bambino and a multitude of charitable events that have cumulatively raised over $10 million for deserving charities and foundations. Imbriano serves on a number of boards and charitable committees. He speaks to colleges, businesses, and organizations across the globe on topics including relationship architecture, customer service, marketing and social media. Imbriano also has inspired college students as a professor of sports marketing at his alma mater, Boston College from 2007-2014. Additionally, he is the co-founder of #sbchat on twitter providing insights and experience to the sports business industry every Sunday night at 9:30pm ET.